This month with Citrus Lane, the theme was "Animal Parade." There were less items in our boxes this month than previous months, but it was still an amazing value! If you do not know what Citrus Lane is, it is a monthly subscription box plan that sends a box to you based on your child's age and gender. The subscription is $25 a month, and you can subscribe HERE. Use coupon code SPRINGFUN to save 10% on a 3 month or more subscription. Total value: $43.33. AMAZING value, and they are not saying I am paying for the "service". You get MORE than your money's worth with this box, and all items you will USE!! This is so cute. I will have to look in to this Citrus lane I have never heard of it before. thank you so much for sharing it. 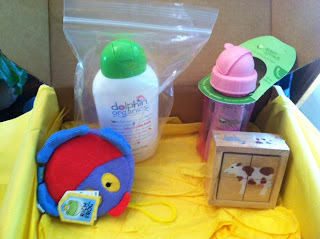 One of the best subscription boxes out there if you have kids! Never heard of this before. Sounds like a great service! Wonderful, wonderful subscription box. My favorite one for kids!